Denver high temperatures were projected to be in the 70’s on Friday, so I decided to give fly fishing another try for the 2010 season. Since it was quite chilly in the morning I busied myself running errands and taking care of other miscellaneous chores, as I waited for the fall sun to warm up the air. I left the house at around 12:30 and headed to Clear Creek west of Idaho Springs. I arrived at the Philadelphia Mills Open Space parking lot and was dipping my boots into the water at 1:30PM. The stream was up a bit from the September low point probably due to melting snow in the high elevations. I began fishing just above the bridge and tied on an olive body deer hair caddis. 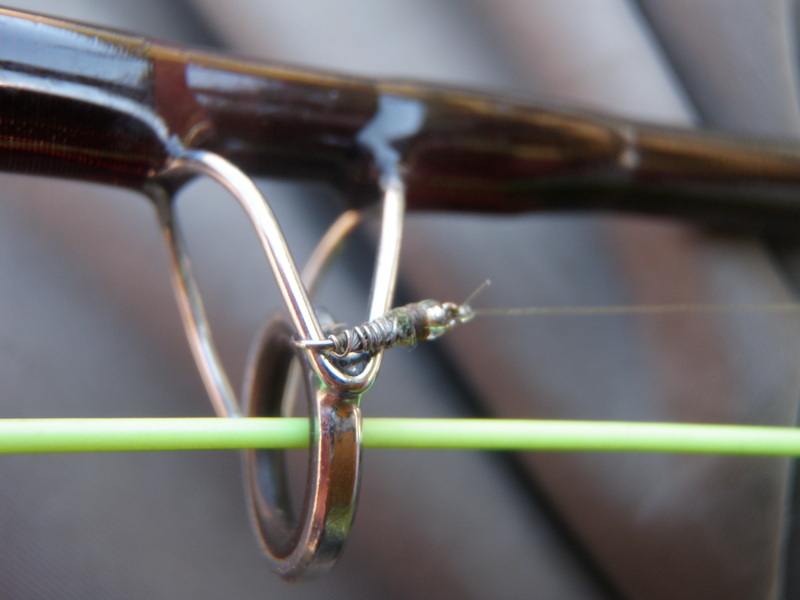 I covered 30-40 yards of water with no success, and concluded that this was futile with the water temperature quite cold due to snow melt, so I tied on a Chernobyl ant trailing a beadhead hares ear on a long 2.5 foot dropper. I fished this combination for an hour or so. At one point I flicked it into an eddy behind a large boulder next to the bank and spotted a fish rising to inspect the Chernobyl, but no take. When I got close to the eddy, I spotted several fish hovering in the slack water below the rock. 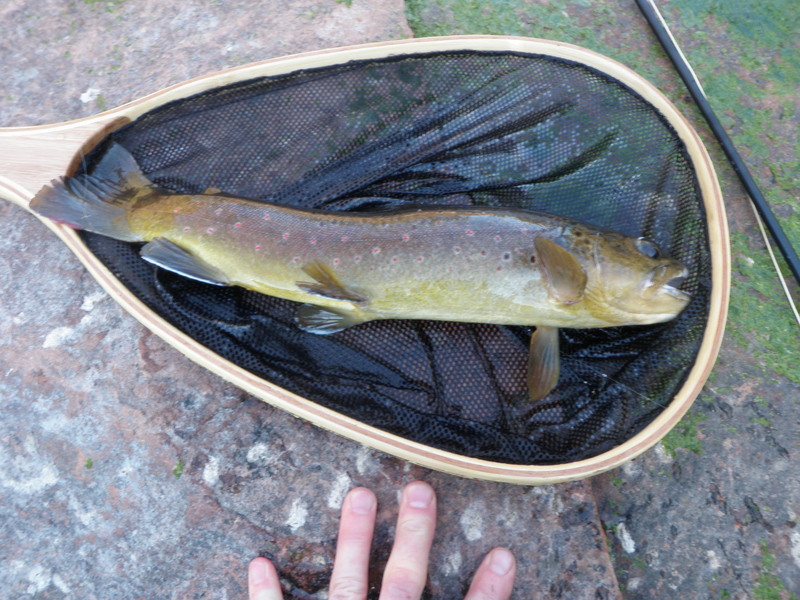 I cast above the rock and felt a tug and landed a small brown trout on the BHHE. I could see at least five trout in this area, but once I landed the small brown, they were showing no interest in my offering so I moved on and considered returning on my way back at the end of the day. 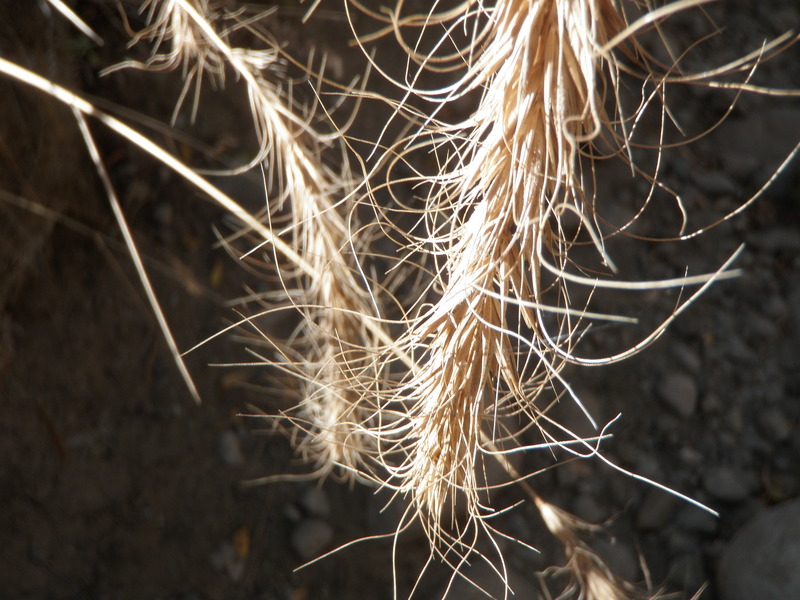 The wind began to gust in frequent intervals, and I ended up with several significant tangles. The wind was blowing from the north across my backcast, and this was causing the double flies to catch my fly line on the forward stroke. I spent fifteen minutes trying to undo one particularly nasty tangle that resulted in tight knots that I picked apart with the point of two fly hooks. Once I’d saved my leader from the epic tangle, I decided to go to an olive woolly bugger with a black marabou tail. I began working the deep pools of which there were quite a few. I tried casting up into the pools from below and bouncing the bugger with an up and down movement. I experimented with casting across the center current and letting the line drag the streamer down and across. The last technique was to cast three quarters downstream and strip the fly back across and then up toward me. I was enjoying the casting and creativity. I’d fished the bottom of a nice hole and placed the rod in my left hand while I grasped my wading stick to move to the top of the pool and try some downstream presentations. The rod was out over the water and the woolly bugger was dangling in the current. When I glanced back to look at my fly I saw a fish quickly move to the surface and grab the fly. I set the hook and landed my largest trout of the day; all of eight inches. It had extremely dark coloration; in fact so dark that I thought it was a catfish at first. 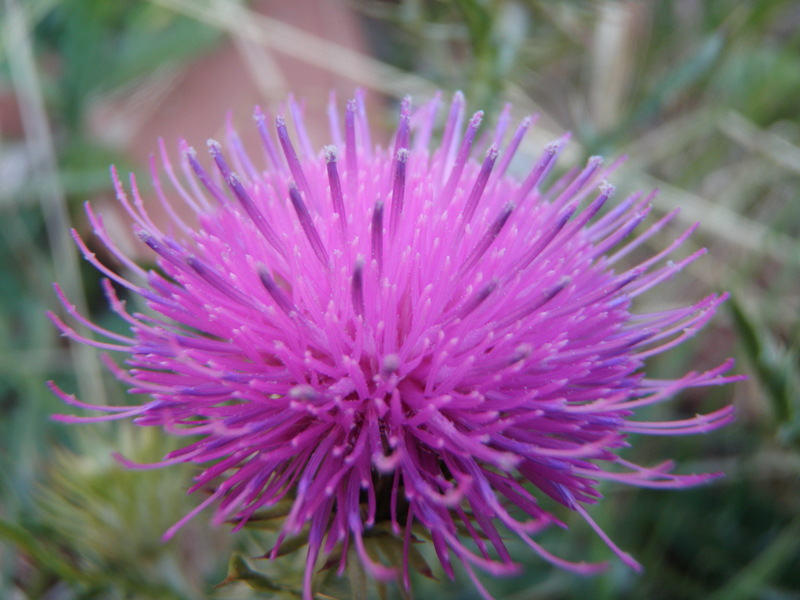 With this positive reinforcement, I continued working the woolly bugger with renewed enthusiasm. But alas it wasn’t drawing any attention, and in fact I wasn’t even seeing any fish. At around 3PM the sun was getting lower in the sky and casting shadows across much of the water, and I was bored with the lack of action, so I hiked up the steep bank and walked back toward the car on the shoulder of interstate 70. When I reached a point which I thought contained the large boulder with the pod of brown trout, I dropped back down to the stream. However, I was mistaken and had to wade downstream along the edge of the bank for a bit before I eventually found the sought after boulder. I stopped above the boulder and swung the streamer down from above and then twitched it through the pocket in front of the rock. I kept recasting and feeding out a bit more line. On the sixth cast the fly swung back toward the side of the boulder, and I felt a bump and hooked and landed a small brown similar in size to the first fish of the day. Next I waded to the top side of the large boulder and peered over the top into the eddy behind it. I spotted a decent sized trout along the stream bottom in the middle of the eddy. I twitched 5-10 casts through the eddy, but the observed trout was ignoring my efforts. I thought perhaps the trout would move to something on top so I tried the olive deer hair caddis, and the targeted fish actually moved up toward it a bit but rejected. Maybe I needed something small? 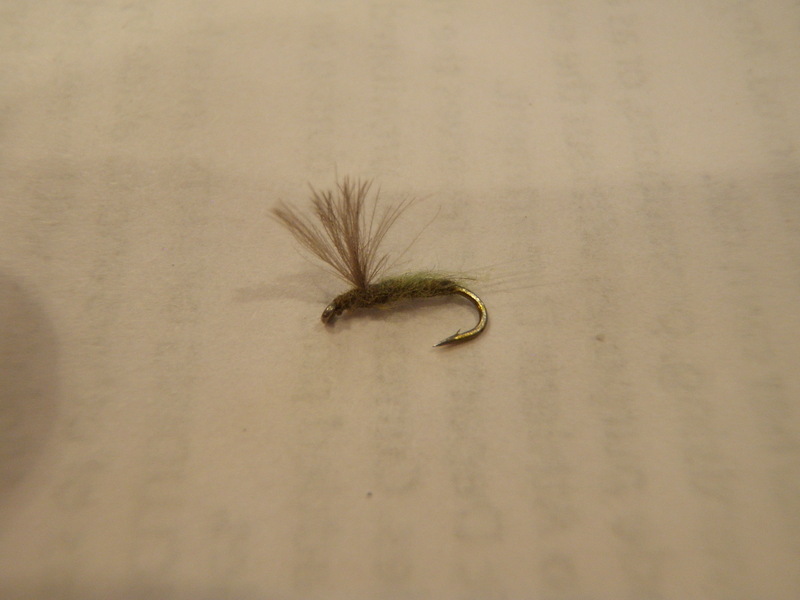 Next I tied on a CDC BWO and tried to tantalize it with the tiny olive morsel. Gusting winds might be blowing ants in the water? I tied on a parachute ant and let it spin in the eddy, but the fish showed no interest. That was enough fun. I allowed the smart eddy resident alone and quit fishing for the day. With high temperatures forecast to spike to 80 degrees on Friday, I decided to make a trek to the Arkansas River below Salida. The reports suggested that the browns were beginning to spawn, and the BWO hatch had pretty much waned, but I decided to give it a shot. Perhaps I could still tempt some fish with BWO nymphs, and I’d caught increasing numbers of rainbows on recent trips, so maybe they would provide interest if the browns were busy spawning. I left Denver at 6:30AM and beat the morning traffic and arrived at my chosen beginning point and was ready to fish at around 9:45AM. It was still chilly, so I wore my light fleece over my fishing shirt. I’d discovered a nice hidden path as I exited the river on one of my trips earlier in the season, so I chose to park at the top of this path. 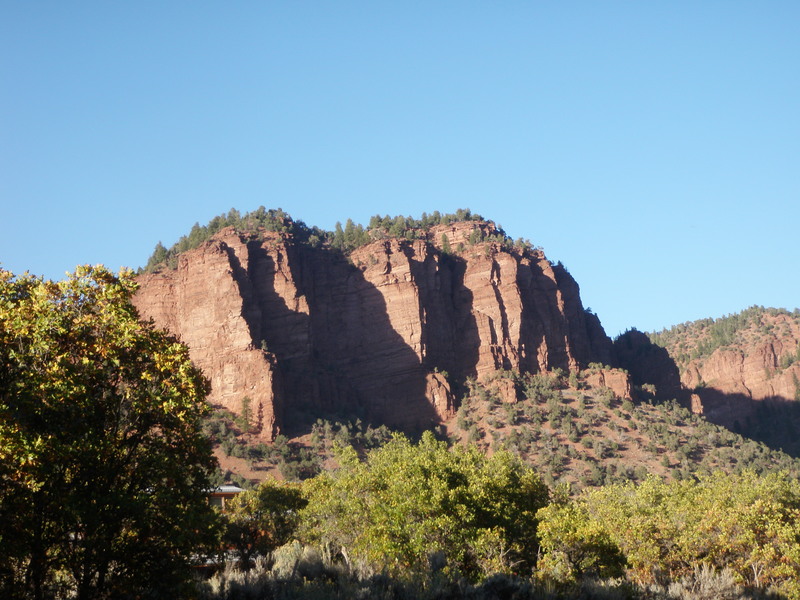 The location is three miles east of Salida just beyond the Arkansas Recreation access spot below the stockyard bridge. I began with a hares ear nymph (no beadhead) and a beadhead pheasant tail with a strike indicator and split shot. 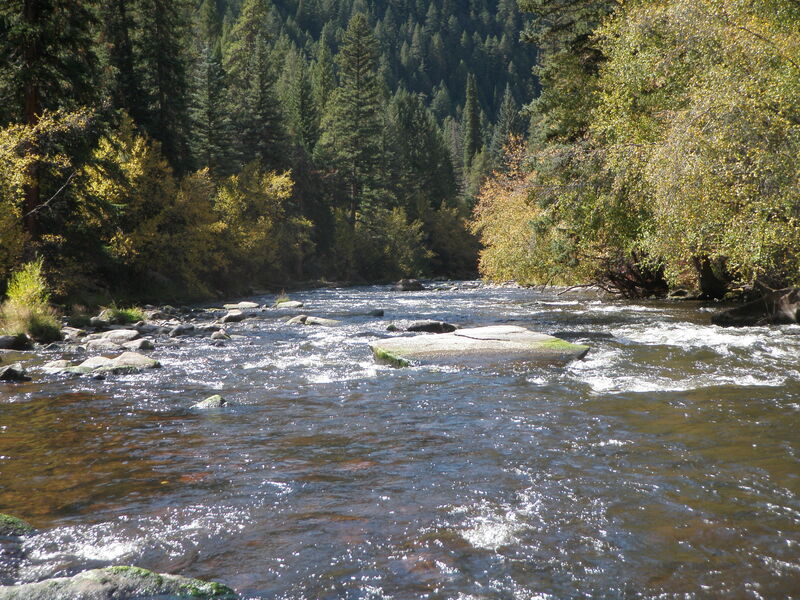 I began working the nice riffles and deeper runs as I fished my way up along the left bank. Much to my surprise, a nice rainbow hammered the beadhead pheasant tail after I’d fished for 15 minutes or so. I landed the rainbow and photographed it and released. Within the next 15 minutes I landed a nice brown trout that was somewhat larger than the rainbow. This brown snatched the hares ear in a fairly shallow riffle as it tumbled back toward me. Two nice fish in the first half hour created some optimistic expectations. I continued fishing in this manner and landed another nice rainbow on the beadhead pheasant tail before breaking for lunch. The rainbow was larger than the first one and probably the same size as the brown. I reached the point where the path ended at 11:30, so decided to utilize it and return to the car. 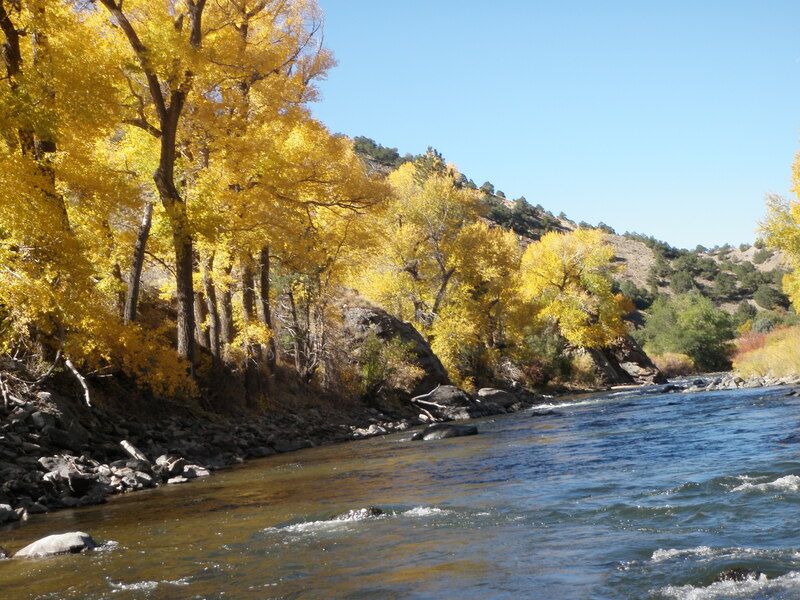 I’d had some success several years ago around this time of year at a bend in the river above the stockyard bridge, so I threw my gear in the car and drove back up the river toward Salida to the stockyard bridge and ate my lunch there along the side of the river. After lunch I took the path down to the river and then went under the bridge and up along the north side of the river to the bend. I slid down a steep bank, and when I looked up the river to the spot I had in mind, there was another fisherman and his two dogs. It was the only other fisherman I saw on the river the entire day, and he was positioned where I wanted to fish! 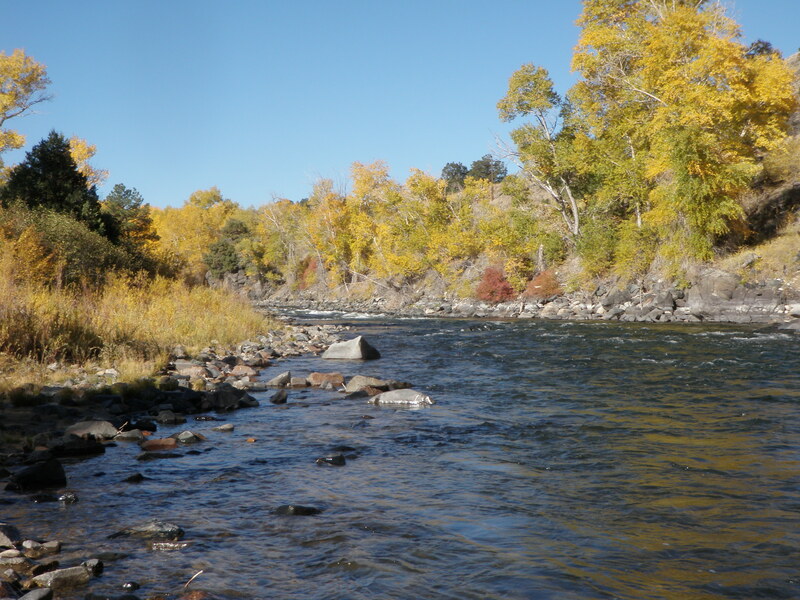 I retreated and fished above and below the bridge a bit, but had no success, so I decided to move back down the river to a point below where I’d begun but upstream from the Fremont-Chafee County border that I fish frequently. I went down the path at the location described and began fishing up the south (left) bank. I wasn’t having any success, but as I approached a long deep pool I noticed a man walking along the shore above me. As he got closer, he asked how I was doing, and I told him I’d caught three in the morning, but it was slow since then. Just when he’d gone below me I cast to a relatively shallow riffle at the tail of the deep pool and hooked up with a medium sized brown. I looked back at the stranger, and he gave me a thumbs up. I moved on beyond the large pool, and as it was now early afternoon, and the air temperature was quite pleasant, I decided to switch to a parachute hopper and a beadhead hares ear. 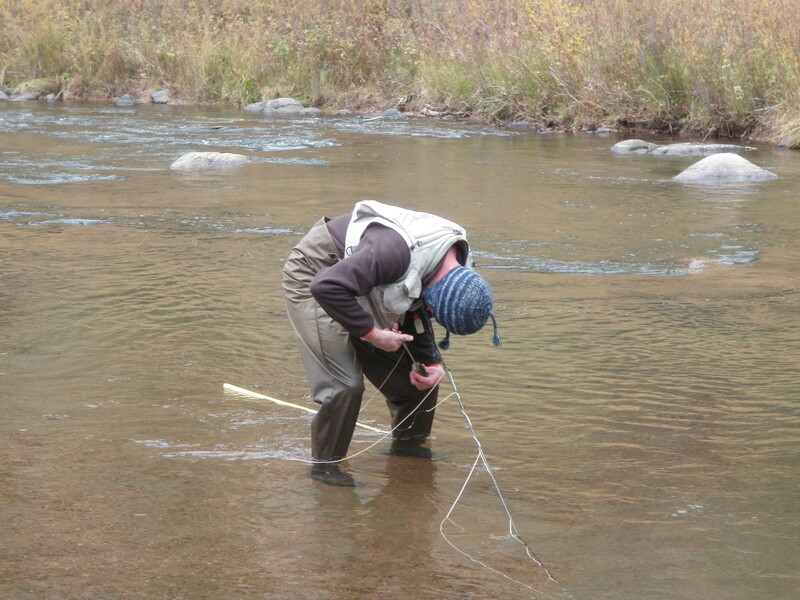 I tied this combination on and began prospecting the pockets and riffles on my side of the river. I had some occasional refusals on the parachute hopper, but by 3PM I’d landed two additional small brown trout on the trailing beadhead hares ear on a 2.5 foot dropper. By 3PM I’d covered the new water and covered for a second time the water I’d fished in the morning. The sky was bright blue and the sun was high in the sky and warm. I debated calling it a day, but then thought about trying the river further upstream closer to Buena Vista. I needed to drive that way to return home anyway. I put all my things in the car and drove to the spot where 285/24 crosses the Arkansas River. I parked at the Wilderness Aware Rafting parking lot and headed down a road used to launch rafts in the summer time. Chernobyl ant, and this remained on my line at the new location. In the first pool, a brown darted up from the lip of the pool and smashed the Chernobyl, but immediately fell off. Next a rainbow jumped on the Chernobyl, but it too released itself. As I moved upstream I began getting refusals to the Chernobyl, and the fish showed no interest in the nymph whatsoever. I’d read that attractors with some red color were working on top, so I clipped off the two flies and tied on a royal stimulator. This fly produced two hook ups in the remaining time on the water. I fished this stretch from 4-5PM. 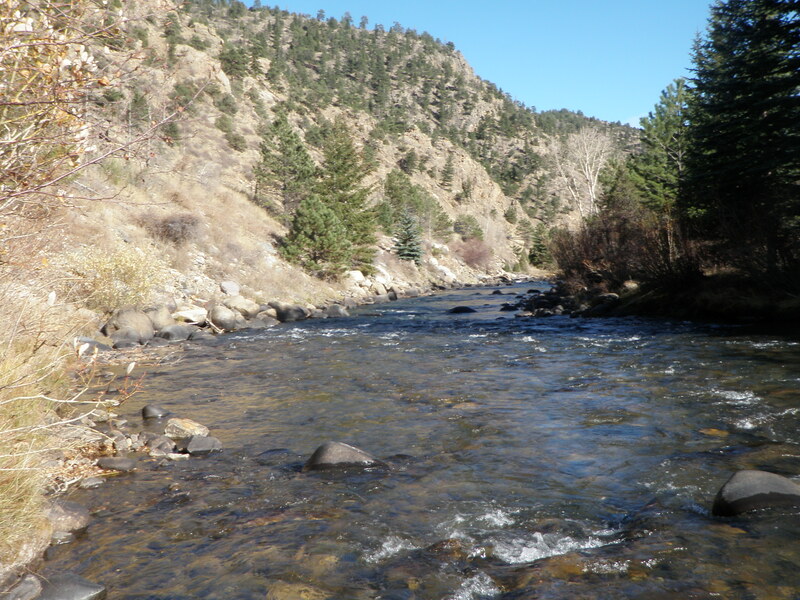 At five I was pretty weary and the fishing action had subsided so I hiked back down the irrigation ditch that paralleled the river and began the drive back to Denver. Location: .3 mile downstream from where Platte Trail meets river. Jane wanted to go to the mountains either Saturday or Sunday. I suggested hiking in to Wildcat Canyon on Sunday and she agreed. I emailed Dan and told him of our plan and invited him to join us. He agreed to meet us at 8AM on Sunday morning. 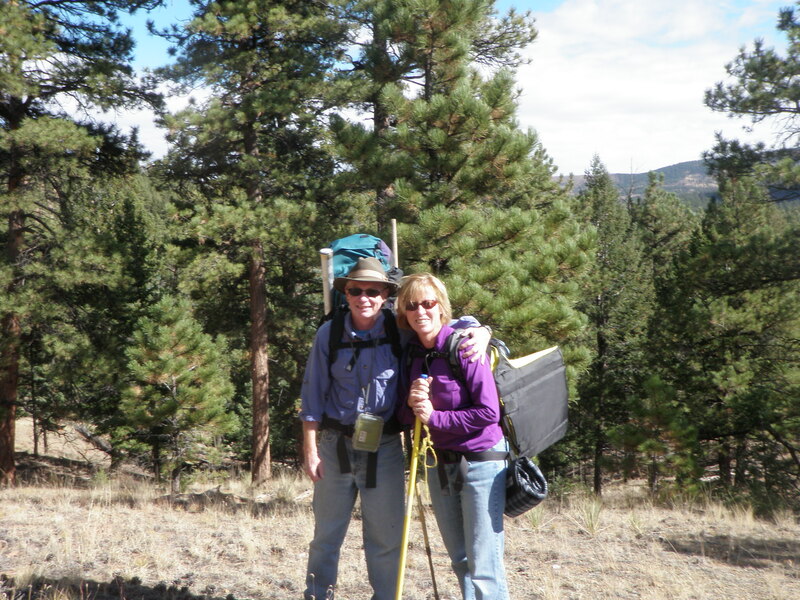 We drove south through Colorado Springs and reached the trailhead at around 10AM where we organized all our gear and clothing and food and began the three mile hike on the Platte River Trail. We arrived at the junction with the river and then continued down the trail on the west bank for .3 miles to a nice clear area with a fire pit. 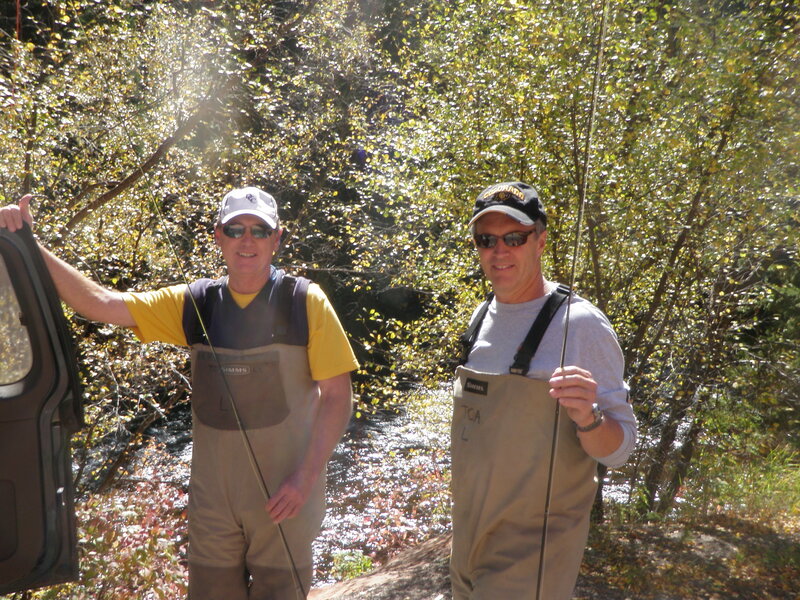 We ate our lunches and then got into our waders and fishing vests and prepared to fish. The sun poked out occasionally, but for the most part it was overcast and the temperature probably never reached 60 degrees. Dan and I wore ski caps and two layers on top, and we were glad we did. We hiked down the trail another .2 miles and then went perpendicular to the trail to the river. Dan began fishing with a Chernobyl ant and beadhead hares ear, while I tied on a caddis and began prospecting on top. In the first hour I landed five trout and Dan picked up three. I was prospecting the left side of the river with the caddis, and I was having luck in fairly shallow riffles near rocks and along the bank. Dan was catching his fish early on the beadhead hares ear. After the initial flurry, the catch rate slowed. Dan picked up another fish on the Chernobyl and I continued casting the caddis and landed a couple more. When we had covered half the distance to the base camp where Jane was set up reading her Kindle, we reached a nice deep run and pool. It was around 2PM, and I was still anticipating a BWO hatch, so I put on a strike indicator, beadhead pheasant tail, and a small beaded baetis nymph. I ran this through the deep run and hooked up on a fish that leaped out of the water several times, but eventually released itself before I could count it. I continued drifting my nymphs through the run and caught and landed a nice rainbow, and Dan photographed the fish and me. Dan seemed to be experiencing more tangles and was catching the trailing nymphs on sticks and rocks. I continued working the nymphs in the deeper runs and pockets and picked up another five fish within the hour. Quite a few came in one particularly nice deep riffle. At 3:30PM we were back at the base camp, and I returned to my pack to restock my fly patch with the small beaded baetis nymphs. Dan took off his waders and rubbed and warmed his feet. The clouds were getting thicker and the wind picked up a bit so Jane decided to begin hiking back to the car. Dan and I prepared to fish for another .5 hour in the beautiful pool directly across from our base camp. When we approached the pool, we observed numerous rises near a rock on the far side as well as in the midpoint of the pool. I decided to work with Dan to see if he could catch some fish on the surface. I stared closely at the water, but couldn’t see any obvious insects, so I elected to tie on a tiny size 22 CDC BWO that I’d tied during the winter. I told Dan it would be difficult to see, as it looked like a piece of gray lint. We decided to try for the fish in the mid-pool first, and Dan shot a nice cast four to five feet above the target area. He couldn’t see the fly and neither could I, but after a moment a fish rose about where we thought the fly was, and Dan set and hooked into a 9-11 inch fish. Apparently the BWO’s were beginning to emerge. 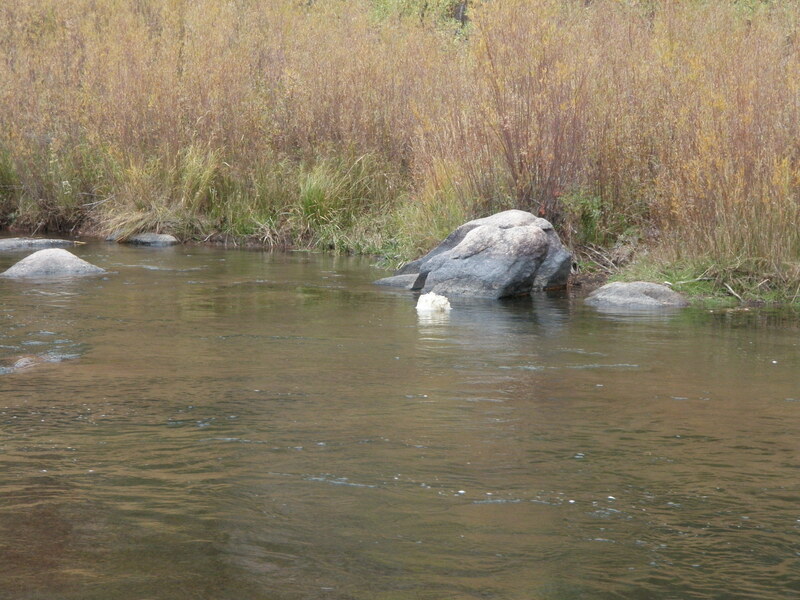 Next Dan targeted two fish rising along the far bank near a protruding rock. 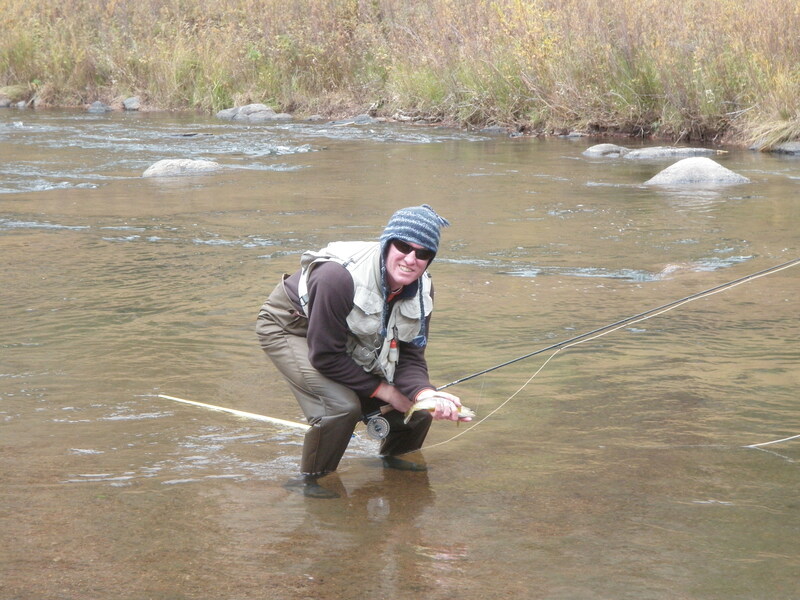 This was a difficult cast as there were faster currents between Dan and the fish that caused drag pretty quickly. After four or five casts the fish stopped rising, so we refocused on the midstream fish and some rises at the very top of the pool. Dan picked off another fish above the midpoint, then returned to the tough fish on the far side and managed to dupe the one that was second in line. 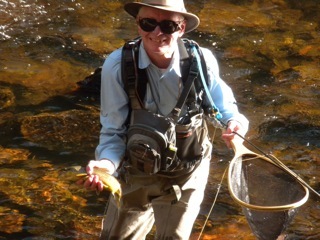 I took a couple of photos of Dan landing and releasing this fish as it turned out to be larger than he anticipated. As Dan was working to fluff the CDC wing, I spotted a rise in the run at the head of the pool, so suggested that Dan move above the mid-pool rock and give it a shot. As I was trying to describe where the fish rose, it revealed itself to Dan with another rise. Dan put a cast above the point of the rise, and right on cue the fish rose and sipped in the BWO. 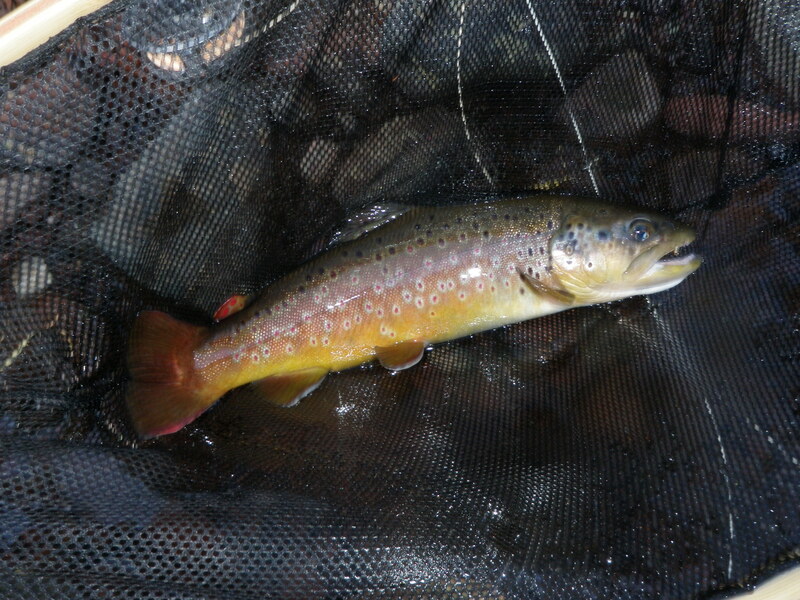 Dan had now landed four trout from the base camp pool on a tiny size 22 CDC BWO. I was quite pleased with his improving skills and success. It was looking more and more like rain as the skies darkened, and it was now moving toward 4 o’clock. I suggested to Dan that we hike up the path to the next pool and look for rises. If we didn’t see any, we’d quit. The next pool was not as juicy as the base camp pool, but it looked like it could produce. The pool was on the left side of the river where the main current angled and fanned out in to some smooth water that was three to four feet deep. 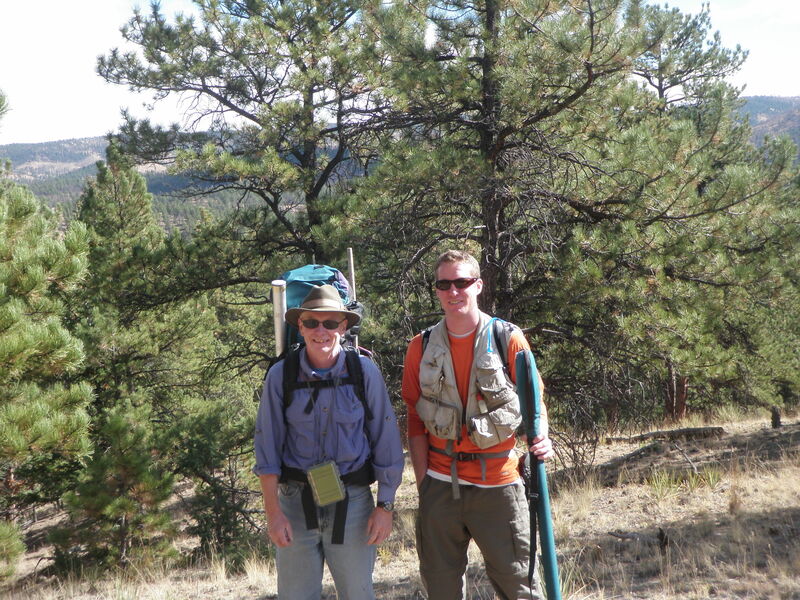 We observed for a bit, but saw no risers, so I suggested that Dan try prospecting the area with the CDC BWO. He made some nice casts and covered the area, but to no avail. 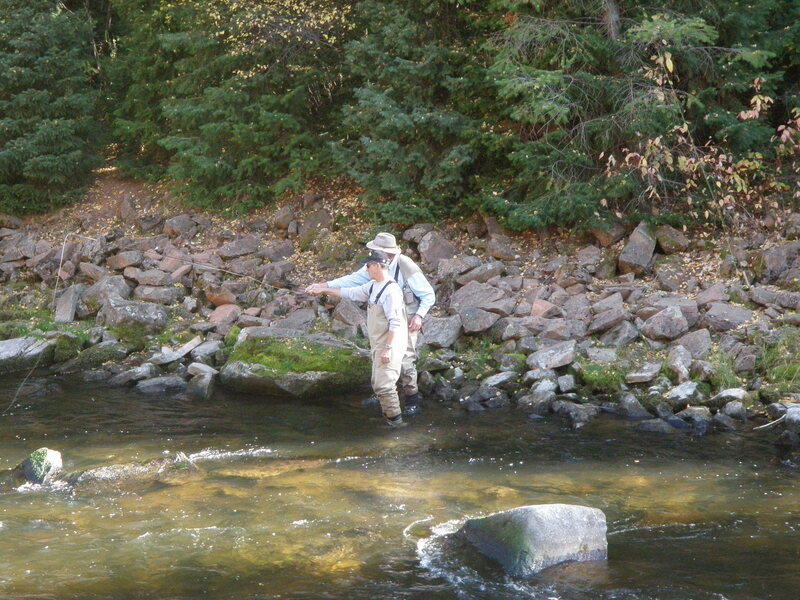 Meanwhile I had tied on an olive deer hair caddis, so I took the left side and began prospecting. 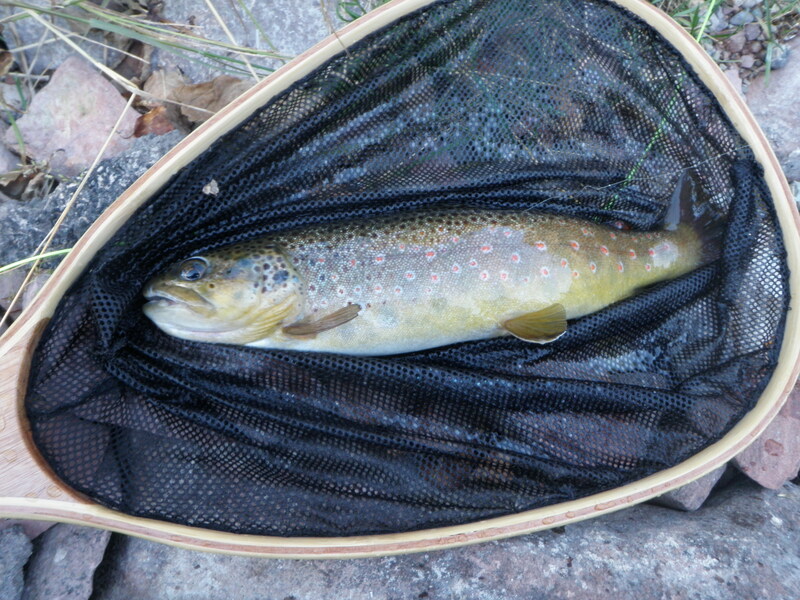 On the fifth or sixth cast just before I was going to suggest quitting, a brown tipped up and took the caddis. I landed my fourteenth fish of the day, and we both decided to pack up our gear and begin the three mile hike back to the car. While we were hiking out, it began to rain, and we had to remove our backpacks and dig in for our raincoats. Jane was enjoying a nap when we reached her in the van at the trailhead. I finished closing the month of August at Saddleback Design on Thursday, and I was anxious to get in some fall fly fishing. The weather forecast called for overcast skies and scattered showers for Friday, so I hoped to hit a nice BWO hatch. BWO’s love overcast wet cool conditions. I needed to remain at the new house and wait for a repairman to come and change out a window in the guest bedroom, so I knew I couldn’t get an early start. This ruled out the Arkansas River or Colorado River, so I focused on the reports on Clear Creek and the Big Thompson River. 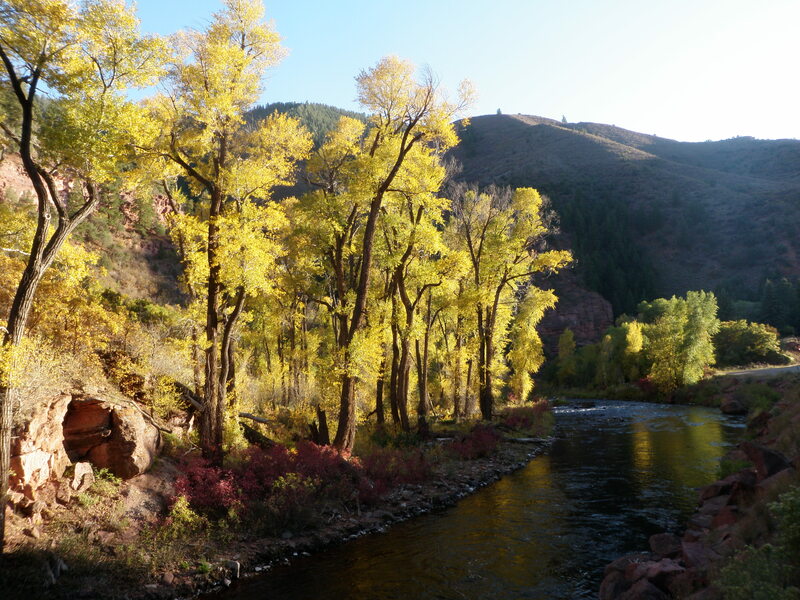 The Big Thompson River mentioned BWO’s in the canyon, so I elected this as my destination. Unfortunately the repairman didn’t arrive until 9:15AM and it took him 30 minutes to complete his work, so I didn’t leave the house until 10AM. 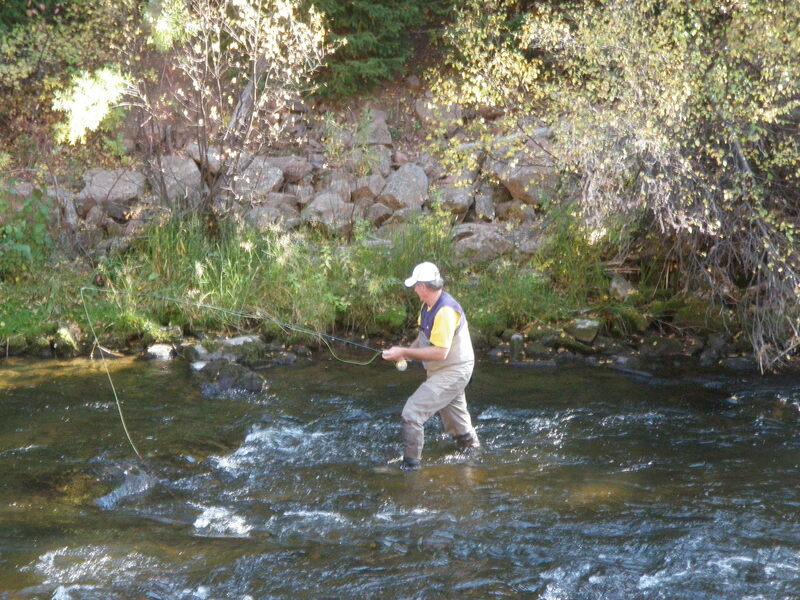 By the time I drove to the Big Thompson and ate lunch, I began fishing at around noon. I chose some water that I’d never fished a couple miles below the dam in Estes Park. As predicted, the sky was cloudy and overcast and the air temperature was cool. While eating lunch, I spotted three trout in a small pocket behind a large rock along the bank. I decided to cast to these fish first before moving downstream and then fishing back up. I tied on a gray body deer hair caddis, but the targeted fish showed no interest. However, I fanned a few casts to the left in a nice run toward the middle of the stream, and a brown rose up and sucked it in. I landed the 11 inch brown, and it seemed to have a disproportionately large hooked jaw for its size, so I attempted to photograph it. When I pulled the camera from my case and tried to turn it on, it wouldn’t start, and I realized that I’d removed the battery to charge and never replaced it. There wouldn’t be any photos on Friday. Having covered the lunch section, I retreated to the road and walked downstream to a point where I saw a private property/no trespassing sign. I cut in to the river ahead of the private area and worked my way back up stream. 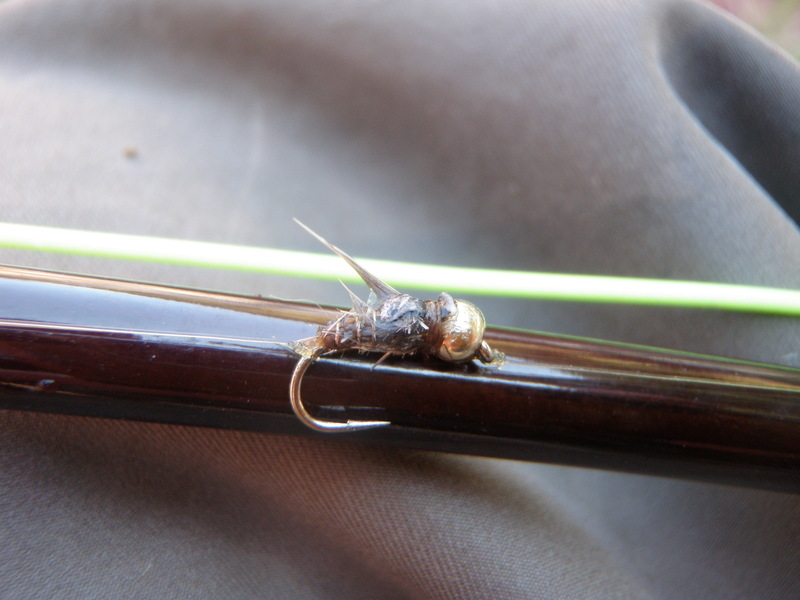 The caddis wasn’t producing so I clipped it off and tied on a Chernobyl ant and beadhead hares ear. I flicked this combination to likely lies and caught another decent brown along the right bank in a shallow riffle on the Chernobyl ant. I continued prospecting and covered quite a bit of water and added two more trout that grabbed the trailing beadhead hares ear. At around 2PM I moved a bit beyond my lunch spot, but I was doing a lot of casting and wading with no action. Judging from the worn bank, I guessed this stretch next to the highway received a lot of pressure, so I decided to move further downstream. As I put my rod and front pack back in the car, I noticed some dark clouds building in the west and moving my way. Perhaps some rain would prompt the BWO’s to emerge and create some great fishing. I drove down the highway another four or five miles and parked just upstream from a location where there is a handicapped platform. 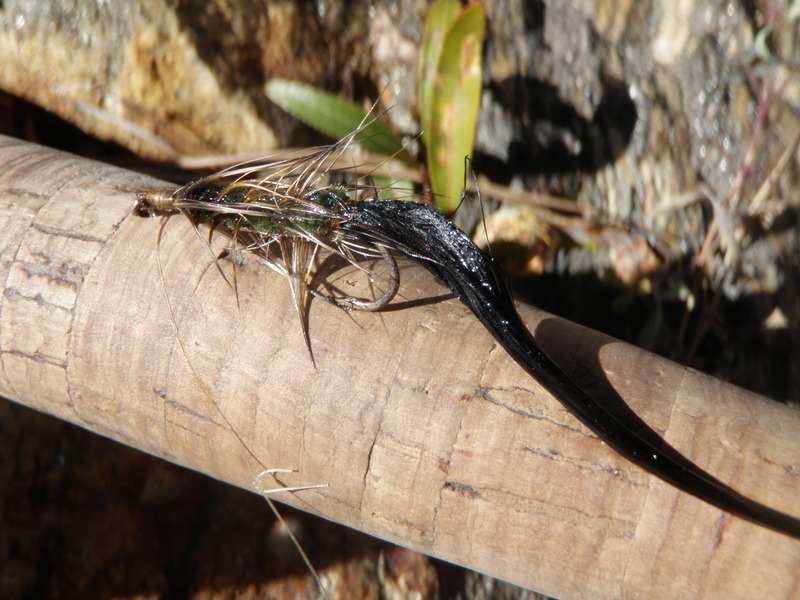 This water presented some deeper runs and plunge pools, so I decided to use a strike indicator and the beadhead hares ear and a small beaded baetis nymph. The wind was now gusting and I put on my ski cap, fleece and raincoat and positioned myself next to a nice deep pool. The wind now began to gust fiercely, and I had to turn my back to the wind and light rain. Over the next half hour I worked my way upstream a short distance making half hearted casts between the strong gusts of wind and rain. My fingers were developing a serious ache, and I wasn’t really enjoying the experience. My mind was anticipating the 4PM Phillies playoff game more than the fishing, so I reeled up my flies and called it quits at around 2:30. I can put up with difficult weather conditions if there is a good hatch or I’m catching fish, but suffering in rain and cold with nothing to show for it is not my idea of fun. 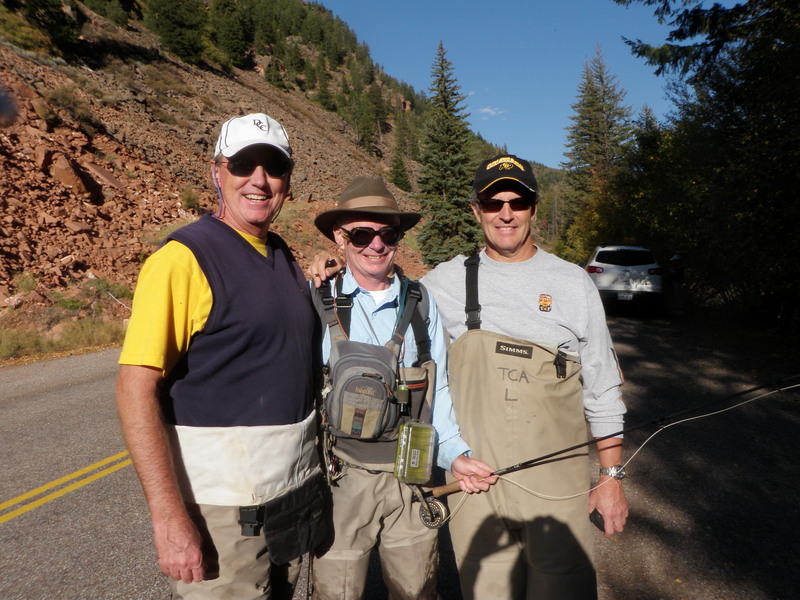 Change is constant in fly fishing. Having fished the Pan on Thursday, I thought I had it all figured out for Friday. Since we’d only been there for a half day, I asked Bill and Judy if I could stay another evening at Bachelor Gulch and return to the Frying Pan on Friday. They agreed, so I was 1.5 hours away from Basalt for another day of fly fishing on the Frying Pan River. Friday was similar to Thursday with a clear blue sky and no clouds to be seen. The high temperature was probably in the mid-70’s. 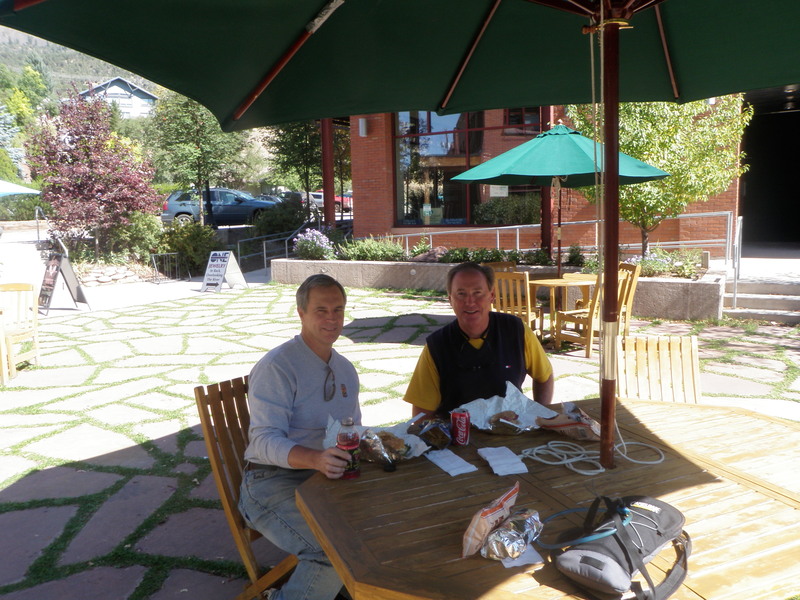 I left Bachelor Gulch at around 10AM and stopped for gas and a Subway sandwich along my way. The rest of the group planned to play tennis at the tennis center, and then drive to Boulder to begin the weekend festivities. I arrived at my destination along the Frying Pan by 11:30 and quickly munched down my Subway sandwich and lunch on a streamside rock. I was confident that I’d seen what was going on Thursday, and I’d catch a bunch of fish on Friday. This would turn out to be true, but the path to success was different than my expectations. The first thing I noticed was that more fishermen were on the water on Friday. I parked in the same spot where the guide parked on Thursday, and there was a fisherman below me. I jumped in 20 yards above him at a spot where the river fanned out a bit, and I had 30 yards of open water before another fisherman was visible. I expected another hatch of small mayflies so I decided to fish nymphs with an indicator. I formed a theory that the deep indicator method is more effective for nymphs during a hatch as the nymphs exhibit more movement as they bounce along the riverbed and portray more movement when lifted from the water or when swinging from a deeper starting point at the end of the drift. I tied on a beadhead hares ear and below that an RS2, then added a split shot and strike indicator. 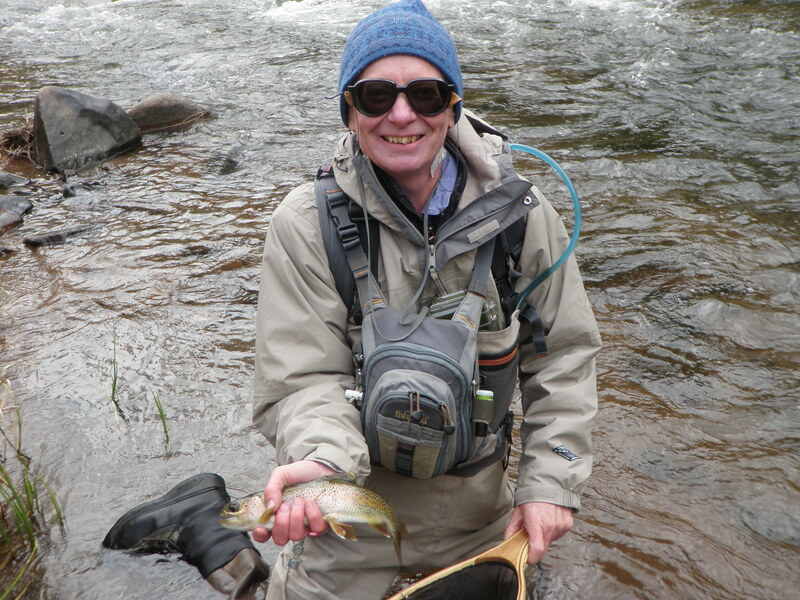 I began flicking the nymphs directly upstream and also up and across and covering the typical water that holds trout. My success was immediate. Over the next two hours, I picked up 13 trout of medium size fishing the nymphs in this manner. 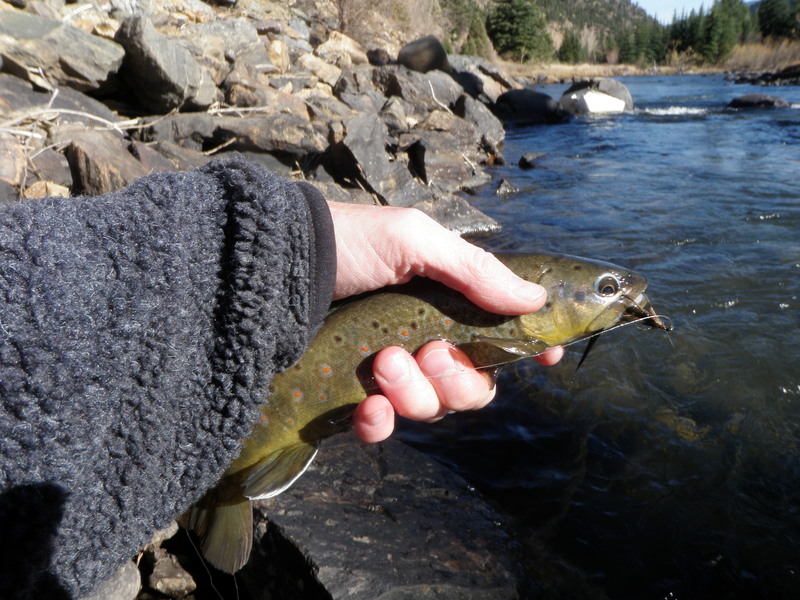 In nearly every deep slot or pocket and even in some fairly shallow spots, I hooked at least one trout. Eventually I moved within a couple of riffles of the fisherman above me, but not close enough to affect his fishing. He continued moving upstream at approximately the same pace that I was moving. I thought that perhaps I shouldn’t fish the water that he recently disturbed, but gave it a try anyway, and didn’t really seem to see much impact. He looked down a few times when my rod was bent with a fish. At 2PM I reached a point where the stream narrowed and the current became quite forceful. I retraced my steps downstream to a point where I could cross back to the road, and then I walked up the road to another nice spot where the river widened a bit. Unfortunately this area contained 4-5 fishermen spaced out pretty evenly, so there wasn’t room for another. I went back downstream and fished a 30 yard section where the river was channeled next to the road with a high bank. This was definitely not as desirable as other areas, but there were some nice deep pockets and slots along the bank that I prospected with the nymphs. Unfortunately other than a hook up and early release at the start, the stretch proved to be unproductive. It was now around 2:30PM and the hatch had ended and fishing slowed perceptibly. I decided to drive downstream to the lower edge of the public water below the dam and see if fishermen were also in that area. I parked in my usual spot for this stretch and hiked to the pool where two large fallen trees span the river to an island. Amazingly there weren’t any fishermen in this area. 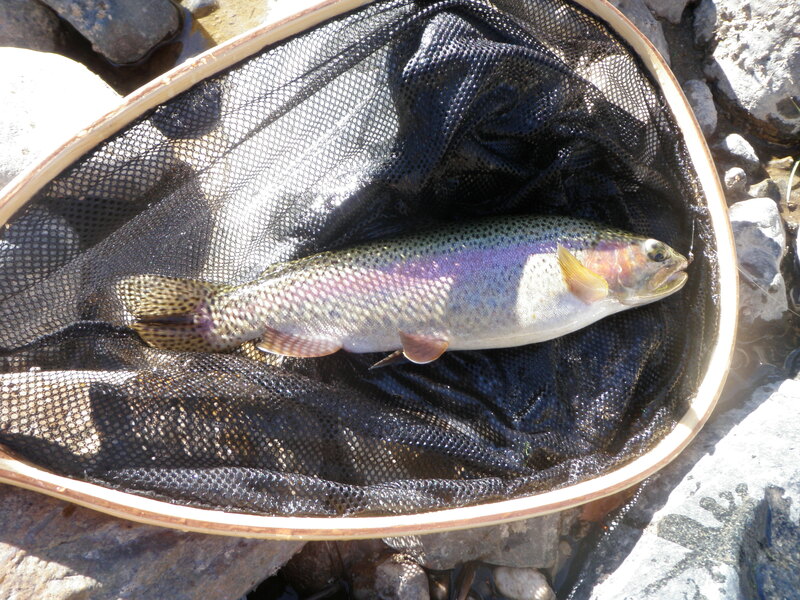 I still had my nymphs on the line, so I began prospecting the tail area and hooked a decent rainbow in short order from behind a large rock next to the bank just above my position. I moved out a bit toward the middle of the tail and experienced a momentary hook up as the nymphs swept past a rock across and below me. As I turned to shoot a cast up and across, I spotted a plastic object floating on the surface. I quickly guessed it was a fly box, so I clutched my wading staff and quickly but carefully worked my way over to the bottom of the pool just above the point where some of the water spills to the small far channel that bends around the island. I reached down and snared the fly box. It was one of the cylindrical boxes used by Taylor Creek when you purchase flies. I glanced at it and stuffed it in my front pack. I could check it out later. I moved back toward the left center of the pool facing upstream and continued casting my nymphs. By now it was a bit after three and most of the pool and run were in shadows. I began to notice sporadic rises, and as I cast the frequency picked up until a couple fish up and to my left were rising in a fairly regular rhythm. Once again the Frying Pan River was going to deal me a serving of good fortune. I reeled up my line and stared at the water for a couple minutes, but I couldn’t see any dense form of food that would explain these regularly rising fish. Without any evidence to select a fly, I guessed based on the time of year and time of day that the trout were feeding on a sparse hatch of blue wing olives or baetis. I tied on a CDC BWO with a light olive body and cast it directly upstream where I’d seen one of the fish rising. I couldn’t see my fly so lifted it to create movement in hopes I could spot it. Much to my surprise, there was weight on my line, and I played a nice 12 inch brown to my net. I used my shirt to sop up the moisture from the fly and dried it and fluffed the wing and tossed another cast up and to my left. Once again I had difficulty following the fly in the glare, but I saw a rise where I estimated my fly was, and set the hook, and I was attached to another nice brown trout. This put my fish count at 16, and these fish were nicer than any that I’d caught earlier in the day up closer to the dam. The next hour would prove to be another highlight of my summer of 2010. I moved to my left as I felt I could follow the tiny BWO when casting from left to right. By now fish were rising all over the place and I could see occasional naturals drifting and fluttering on the surface. My imitation looked like a small piece of gray lint, not very unlike the naturals. But as more fish rose and more natural competition appeared, my fly became less desirable and I noticed quite a few refusals. In the process of false casting vigorously to dry the CDC wing, I snapped it off. I tied on another one but with a denser wing and slightly darker larger body. This fly was universally rejected, and I was beginning to despair. I selected a tiny one from my foam pocket with a sparse CDC wing, and as I was tying it to my line, I heard a voice from the street behind me, “Yo. Do you mind if I wade across at the tail and fish the other side?” I replied, “Go ahead” and refocused on attaching my tiny CDC BWO. 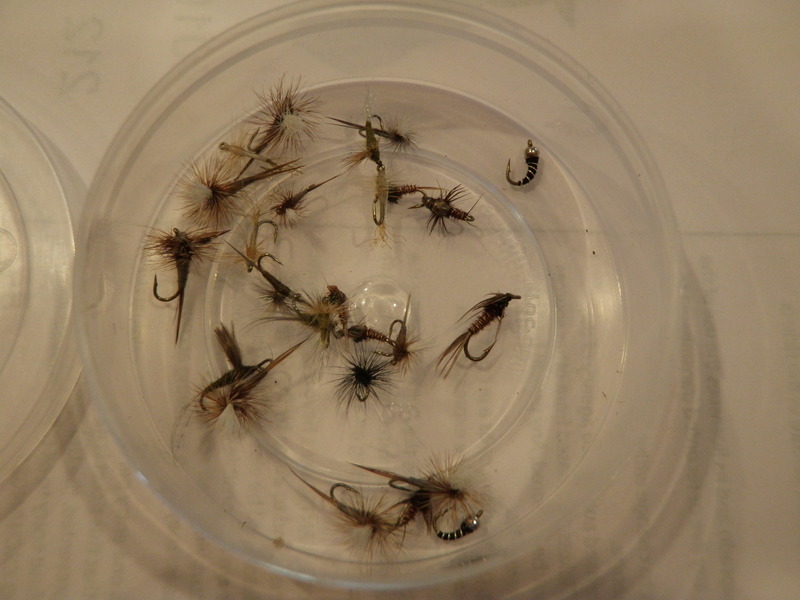 The small sparse CDC BWO began to produce. I picked up a pair of chunky medium size fish, one brown and one rainbow on the third BWO imitation I’d tried. I moved up along the bank so that I was now casting directly across or perpendicular to the main current and doing a curve cast or instant mend and fishing mostly downstream to the 8-10 rising fish in front of me right at the point where the main current in the middle of the river fanned out into a nice riffle and pool. Meanwhile I kept glancing downstream and the gentleman with white hair and a ball cap who had accosted me from the road, had waded in to the river five feet and was working on his line with his back to me. He must have been in this position for at least 15 minutes while I was catching the couple fish described. He looked like the general in White Christmas, and I envisioned him as a retired military officer who was an intense expert fly fisherman. I refocused on my fishing and the risers now that I discovered a fly that was producing. I noticed there were 4 or 5 fish casually rising and sipping perhaps 20 feet across from me. As I had a side view, I could tell these were larger fish. 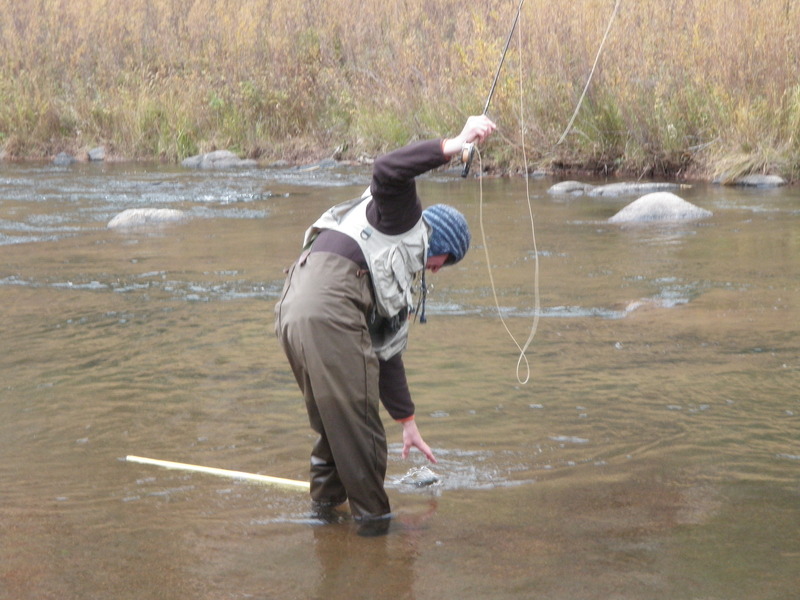 I began working curve casts straight across with a couple mends and one of the larger fish rose right when the fly began to drag a tiny bit at the downstream end of the drift. Would this fish rise again? I shot a couple more casts and drifted the same lane. On the second cast, the large fish emerged and sipped in my fly. The fight was on, and I eventually coaxed a beautiful fat rainbow into my net. It spanned my new longer net from tip to tail. As I was working to photograph and release this prize the white haired fisherman declared, “Nice fish. What did you get him on?” I replied, “A tiny blue winged olive”. He was now across and 10-15 feet downstream from me. I quickly worked to soak the water out of the fly and refluff the CDC wing. When I had the fly in working order, I shot a cast across and above where the rainbow had materialized. Meanwhile the general was now facing toward me and still working at tying on a fly or untangling a line. 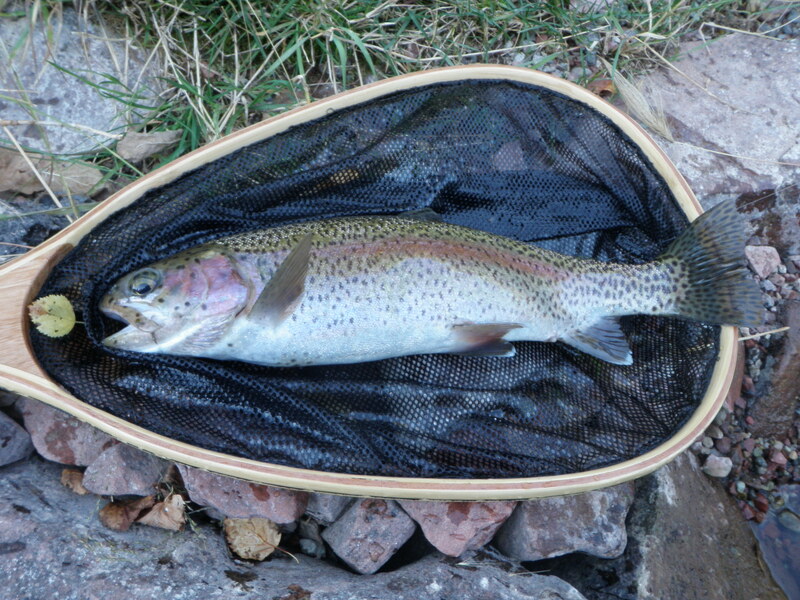 It didn’t take long after landing the fine rainbow before a trout tipped up and sipped in the BWO. The fight was on and this guy dove and shook and flashed all the characteristics of a brown. 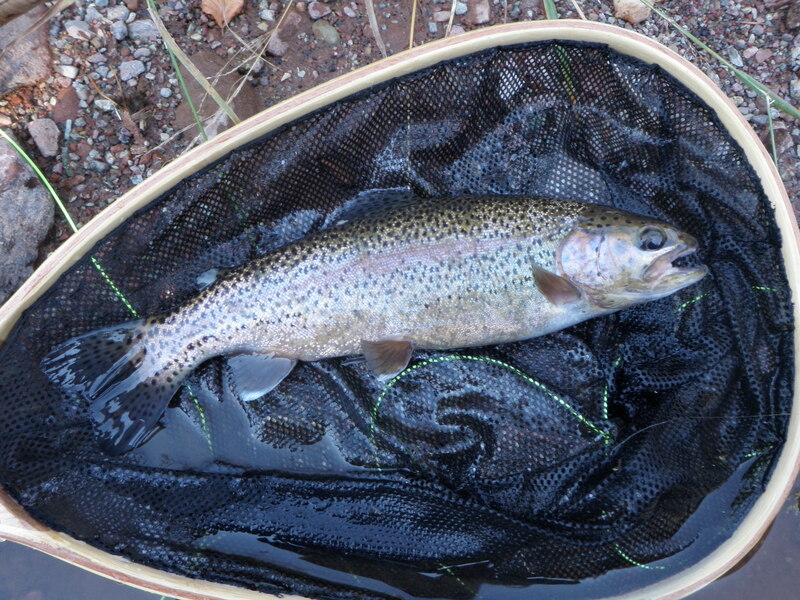 Eventually I brought the brown to my net and it was a beauty and comparable in size to the previous rainbow. My new fishing companion couldn’t contain himself, and yelled, “It’s hard to stand over here and watch you catch these nice fish.” I replied that his fly was barely on the water. Finally the general was ready to fish. While I worked my fly to dry and fluff it, he finally shot a cast upstream and it didn’t take long before he hooked up with a fish. The fish didn’t appear to be that large when it came near the surface, but it took him down to the tail of the pool where he waded downstream and eventually netted it. At this point he announced that he foul hooked it. Next he asked me what size leader I was using. I replied 5X. He seemed to be in disbelief. I was back in business and made some shorter casts to nearer regular risers and landed a 10 inch brown. I glanced over at my companion and I saw him lift his fly in a hook set motion and almost simultaneously a fish rose next to his fly. I asked if the fish went for his fly, and he said he could not hear me over the roar of the river. But shortly afterward, he mentioned that he broke his fly off and he was using 7X! I was catching fish with my tiny BWO on 5X, and he was breaking off flies with his fine 7X. The hatch was beginning to wane, and I managed to bring a 22nd fish to net while the new friend continued to work on his fly and line. The fish near me nearly stopped rising, and now most of the risers were further away from me on the opposite side where I had difficulty getting a good drift due to the intervening currents. The other fisherman was in perfect position to cast upstream to these fish. The stream was now totally covered in shadows, and I was feeling quite chilled standing in the icy flows with just my fishing shirt for warmth. I decided to leave the nice rising fish for my friend and go back to the car for my fleece. But after I climbed the bank and walked back to the car, I looked at my watch and noticed it was 5PM, and I had a 3.5 hour drive ahead of me, so I elected to call it quits. I removed my waders and broke down my rod and climbed in the car. I did a U turn and rolled down my window to possibly say something to the other fisherman as I drove by. I assumed he now had the pool all to himself with some risers still entertaining him. As I approached the spot where I’d been fishing I looked down and no one was there. In the course of the hour or so that he was near me, I didn’t see him make more than five casts! But what an unexpected treat the late afternoon proved to be. I landed 9 fish mostly bigger and stronger than the first 13 including the two 15+ inch bruisers. It was another epic day on the Frying Pan.